Rabbi David Levin, the grandson of the great Reb Arye Levine, tells this story about a loan that his grandfather accepted. Reb Arye tried very hard to avoid borrowing money, but one time it was quite urgent. In addition, his salary was about to come imminently, that very evening. So he asked a shopkeeper in Machane Yehuda to allow him to take items needed on credit. Reb Arye took 50 pounds worth of merchandise and told the store owner he would return in the evening. That night, there was a heavy snow storm in Jerusalem. Reb Arye was a bit hesitant to go out due to the weather, and did not even have proper winter clothing nor shoes. But his wife implored him to keep his word and go out, which he did. The walk was a good distance. When he approached the shopkeeper's house, he heard a loud argument coming from inside. The man's wife was berating him for lending a customer the relatively large sum of 50 pounds. She angrily wanted to know how her husband was so sure the customer would pay up. The shopkeeper retorted that there was nothing to worry about as the legendary Reb Arye was completely trustworthy. 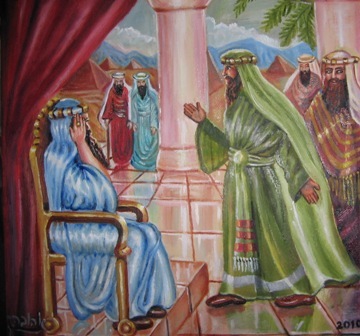 As Reb Arye knocked on the front door, the wife answered it. She promptly blurted out, "Really, Reb Arye! For this you had to walk your feet off in this nasty, miserable weather? Could it not have waited until tomorrow?" The Ceremonial Offer - quest..